Luc Beauséjour has made a selection of German, Italian, French and English pieces from the Baroque period, a repertoire in which he has become a performer of choice. He has chosen first of all two sparkling sonatas by Domenico Scarlatti (K1 and K159), a Ground by Henry Purcell, Georg Böhm’s Prelude, Fugue and Postlude, excerpts from Jean‐Philippe Rameau’s Les Indes galantes, Johann Sebastian Bach’s Toccata in E minor, BWV 914, and the same composer’s magnificent transcription for solo keyboard – BWV 974 – of Alessandro Marcello’s Concerto in D minor for Oboe and Strings. He rounds the recording off with an early‐Baroque Corrente by Girolamo Frescobaldi, a Pavane by Louis Couperin, and finally George Frideric Handel’s exquisite Suite in D minor, HWV 437. The final word belongs to the performer, who provides a concise summary of his musical journey: “In any event, what matters here, as is always the case in music, is the pleasure of playing and of introducing listeners to the works of these great composers. 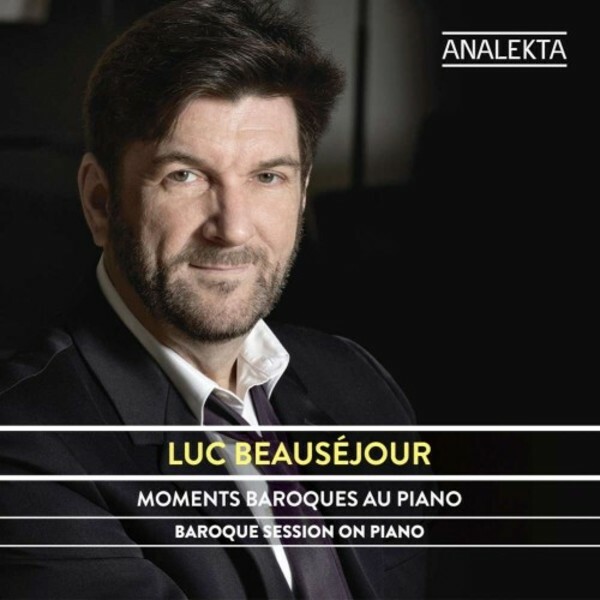 And this project has provided me with considerable pleasure – I only hope you’ll enjoy every bit as much!” Baroque Session on Piano is Luc Beauséjour’s 24th recording for Analekta, but his first at the piano.